The author's three-screw Ruger Blackhawk is the lone .41 Magnum in his arsenalâ€”a fact that needs to be changed. Like many people, I root for the underdog, and that tendency spills over into my gun choices. Favorite shotgun gauge? 16, of course. Favorite rifle cartridge? The .280 Remington. So it makes sense then that of the straight-walled revolver cartridges I have an affinity for the .41 Magnum. Developed in the 1960s by revolver aficionado Elmer Keith (who had also brought us the .44 Magnum)â€”with help from legendary handgunners Bill Jordan and Skeeter Skeltonâ€”it filled the gap between the .357 and the big .44, and Keith's goal for it as a law enforcement round. But it didn't pan out that way. Smith & Wesson developed the models 57 and 58 for it, but while Keith envisioned two loadsâ€”a relatively sedate 200-grainer at less than 1,000 fps and a smokin' 210-grainer running at more than 1,300â€”the mild load never saw the light of day. The result? The 4-inch Model 58, the law enforcement gun, was too much for most officers to handle. And for sporting use, there wasn't anything the .41 could do that the .44 couldn't do better or at least as well. What really doomed the .41 to cult status, in my opinion, is the lack of an alternative chambering. The .357 and .44 Magnums have, respectively, the .38 and .44 Specials that allow you to enjoy shooting with low-power, lower-cost ammo. 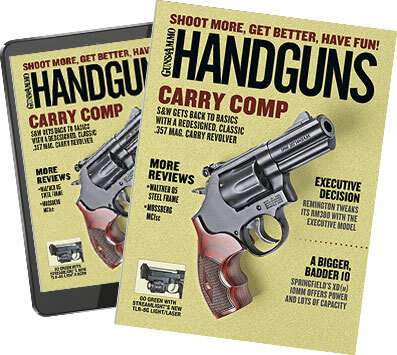 And in both cases for the person who wants his or handgun to do double duty, both Special loads are excellent for home defenseâ€”controllable and effective. But I still love the .41 because it's different and because it's not popular. Fortunately I'm not totally alone. "We sold and continue to sell .41 Magnum revolvers at a somewhat mediocre rate," Smith & Wesson's Paul Pluff told me. "The .41 has somewhat of a cult following, and those who own them tend to own several in that caliber. I think we will continue to see the sales of that caliber year after year stay the same." See, that's why I love this job. Mr. Pluff has now given me the ammo I need to go to my lovely wife and say, "Gee, I have just the one .41. Seems I should have more!" 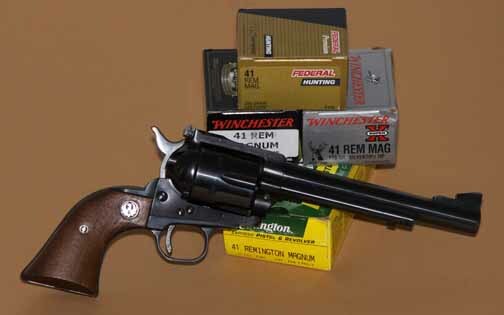 My current .41 Magnum is a Ruger Blackhawk, a platform I love. It's an older three-screw model, and it's pretty accurate, despite the fact I haven't tried loading for it. And here's what I like about the .41 Magnum. Even with full-house loads, it's very comfortable in the Blackhawk, more so than a similar Blackhawk I have in .44 Magnum. And to revisit and rephrase a point I made earlier, as a hunting cartridge the .41 Magnum will do nearly anything a .44 will do. It's got more than enough punch to handle deer, wild boar and similar game with the right bullet. The question of what new production gun to add to my battery is a tough call, even though there aren't a ton choices. Smith has brought the classics backâ€”the Model 58 with 4-inch barrel originally designed for police and the 6-inch, adjustable-sight 57 that was intended as more of a hunting gunâ€”along with a Model 657 with 2.63-inch barrel. I've shot the Model 58, which I immediately thought about getting when it was announced a couple of years ago. But I can't say I enjoyed it much. With full-power loads I discovered the same thing many law enforcement officers did back in the day: It's a handful. The 6-inch 57, which I haven't shot, might be a better choice, as might one of the Taurus offerings. Taurus has a couple of Raging Bulls chambered for the .41 (6.5 and 8 inch barrels), as well as two Trackersâ€”a snubby and a 4-inch. The latter is intriguing. While it has the same barrel length as Smith's Classic 58, it has Taurus' comfy Ribber grips (as opposed to the checkered wood grips of the 58, which sting with typical .41 loads), and its barrel is ported. At less than $600, this might be the one I can get my wife to sign off on. If money were no object (like that's ever the case) and I wanted another single-action, I'd jump at the chance to buy a Freedom Arms Field Grade with a 7.5-inch barrel. Several years ago, I hunted with a Freedom Arms .41 in conjunction with Winchester's introduction of a Platinum Tip hunting load for the cartridge. I killed a good wild boar with it and fell in love with the gun's beauty, function and outstanding accuracy. Certainly you get what you pay for, and in the case of the Freedom Arms gun you're buying what's essentially a custom revolverâ€”hence the nearly $1,900 price tag. Whatever I end up getting, the day I order it I'm buying a set of dies, which I should've done years ago and probably will buy anyway. The only way to get the most use and enjoyment out of the .41 is to handload for it. If you've got some pet loads, please share!